Over the past week, the UCLA’s Charles E. Young Research Library (YRL) has been featuring “scary” books from its special collections on its Facebook page. I think that is a fantastic idea, a great way of showcasing some of our fabulous materials. Oliver Mattheusens, a library assistant in my department, has certainly been enjoying himself in coming up with the materials and the status updates. He actually has a lot more stories to tell about these books, but doesn’t have the time to write up an involved post. So, I’m copying his Facebook posts, with some minor editing, into this blog post so that it’s easier to read and follow (that timeline just doesn’t make for easy reading!). Mostly copying, that is. I’ll do some editing, paraphrasing, and adding of more information, as well as some of my own and others’ comments. In picking the five books for this series, Oliver did not limit himself to the definition of scary as frightening, but also included the macabre, the magical, and the grisly. In addition, he didn’t look at just the contents of the books to define scary, but also the production, provenance, and use of the books. He went through a couple dozen books before deciding on the final five. I think he did an excellent job! Hi YRL fans, tomorrow we’ll start with our “Scary Books from the YRL” series to celebrate Halloween. 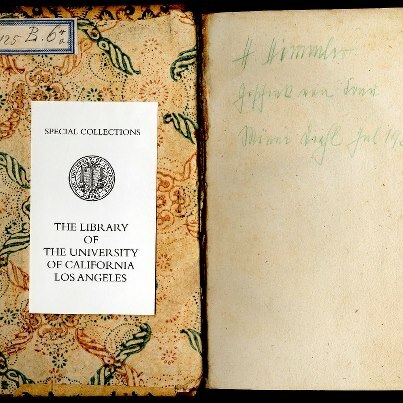 The first book is quite unique, the oldest of its kind in fact, and so scary that even the most hardened UCLA librarians do not dare touch it. I think he’s right. I’m not sure I would touch it. But then again, I just might so I can say I’ve done it. …The binding is human skin. 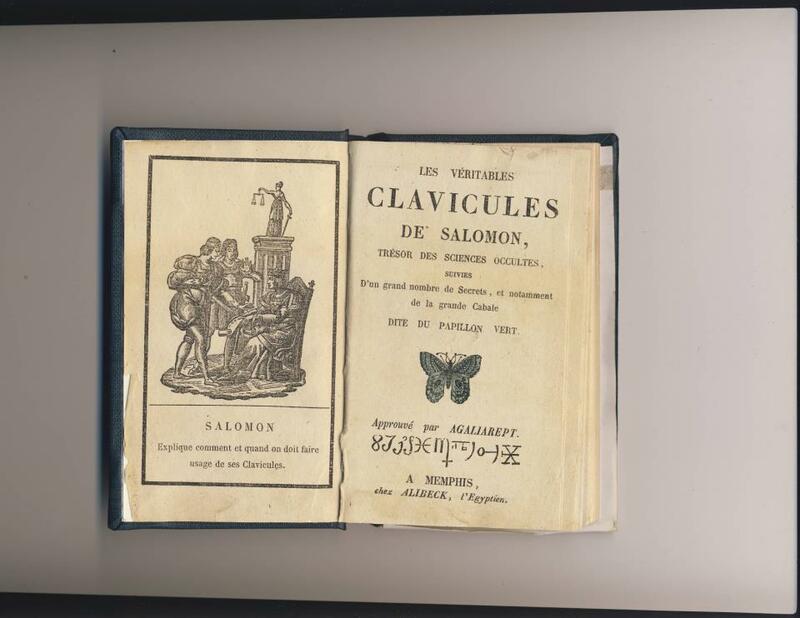 The book is from the library of Armand Jerome Bignon (1711-1772), librarian of Louis XV. 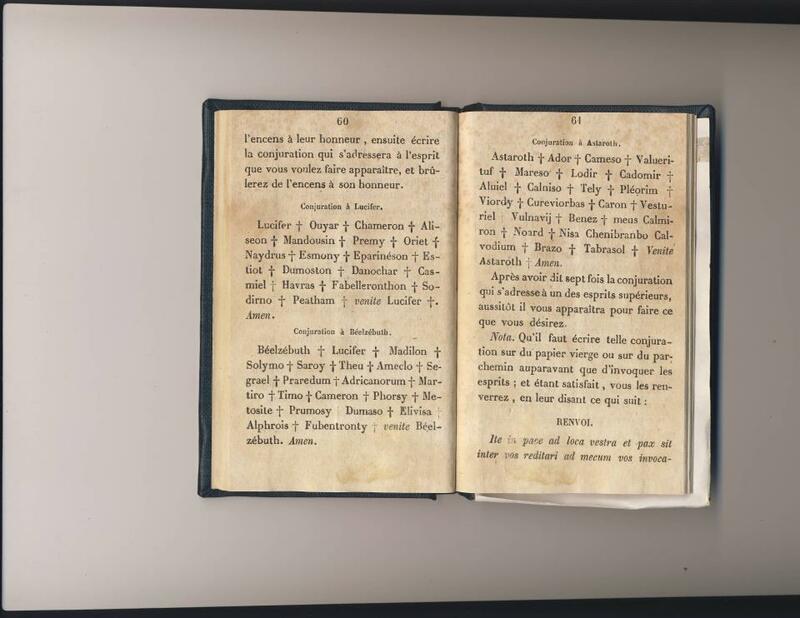 We are not certain whose skin was used, but according to the “Religatum de Pelle Humana”, Louis XV was rumored to have a book bound in the skin of one of his ex-mistresses. 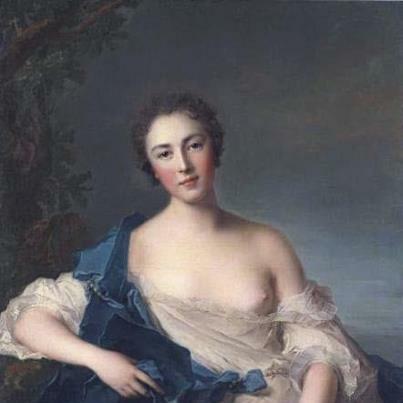 The most likely candidate is Pauline Félicité de Mailly-Nesle, Marquise de Vintimille. 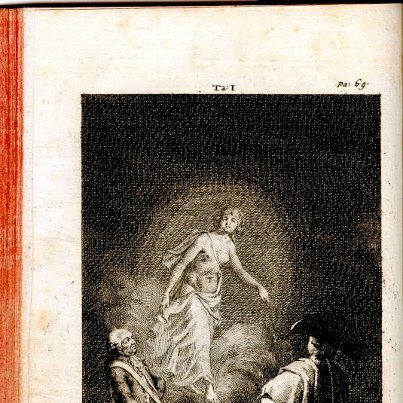 Pauline Félicité de Mailly-Nesle, from mistress of 18th century French King Louis XV to book in YRL Special Collections. C’est la vie. When I saw the posting, I wanted to know which book it was and asked for the title and call number, since that information had not been included in the original post. Oliver told me that Special Collections did not want the information included, as too many people might request it. In fact, a lot of people did want to see it, so Special Collections hurriedly did a display in their flash exhibit case. And I was one of the folks who went to see it. It was only there for a few days. 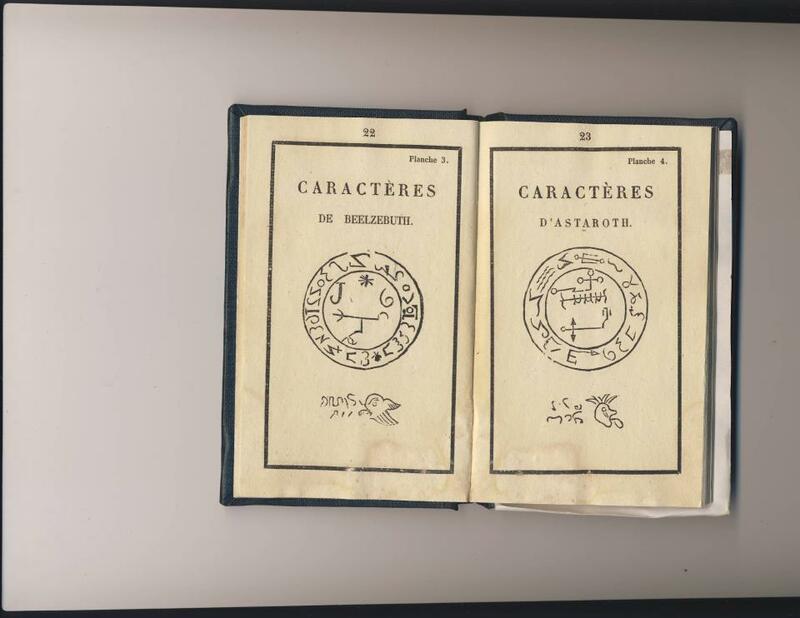 Grimoires were textbooks of magic, used to divine the future, cast spells and summon supernatural creatures. 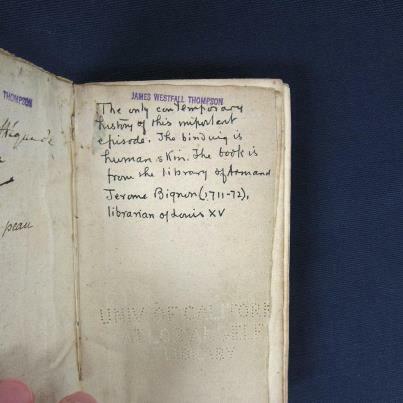 When we were leafing through the book, we found handwritten marginalia next to a paragraph about animal sacrifices, indicating that its owner had actually used the text. The logo of publisher Aldus Manutius, a dolphin intertwined with an anchor. 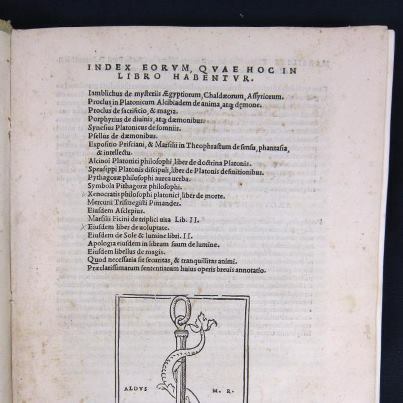 Aldus Manutius was a Renaissance book publisher in Venice, who pioneered many of the techniques still used in modern book printing, such as the use of italics and “paperback” editions of famous works. 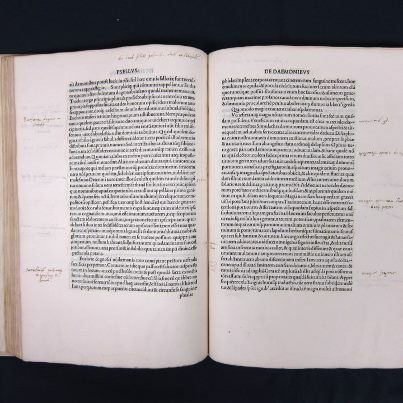 YRL has one of the largest collections of Aldus Manutius imprints in the world. 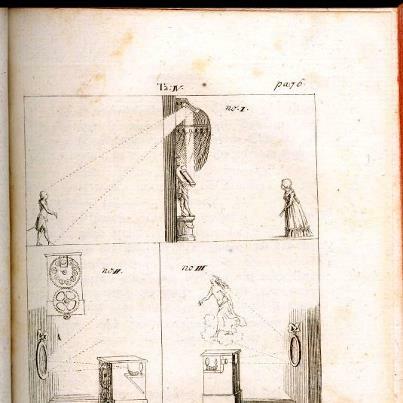 …an encyclopedia of magic written in the 18th century by the Bavarian mystic Karl von Eckartshausen, founder of the Illuminati and one of the first people to use magic lanterns to conjure up ghosts. The scary thing about the book is not so much the book itself, but who it belonged to: Heinrich Himmler, head of the SS during the Third Reich and devout believer in pagan mysticism. The book was a private gift to Himmler and part of his large collection of occult books. 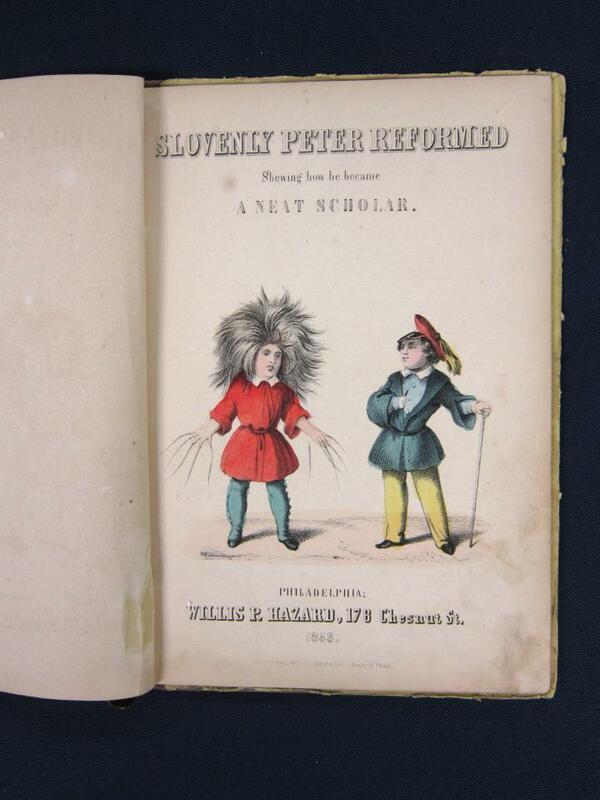 The main character was apparently the inspiration for Tim Burton‘s Edward Scissorhands. The book was supposed to be a children’s primer, teaching elementary school kids “good manners” and tips on how to be “neat scholars,” but nowadays reads more like a little book of horrors that traumatized millions of 19th century children for life. 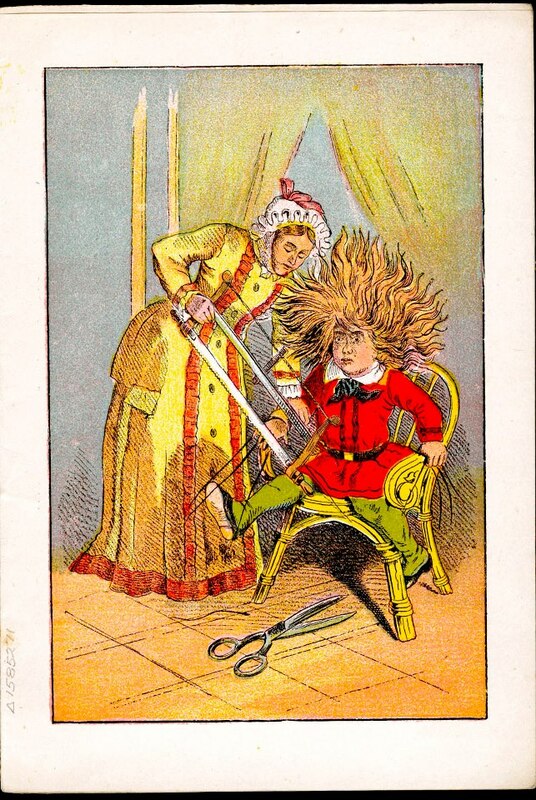 The Struwwelpeter books contain poems about different kinds of children’s “vices,” meant to illustrate the terrible consequences of immoral behavior. This one is about a girl who liked to play with matches and got burned. Notice how the tears of her cats form a tiny lake with an island for her slippers in the middle. hey I know this story! 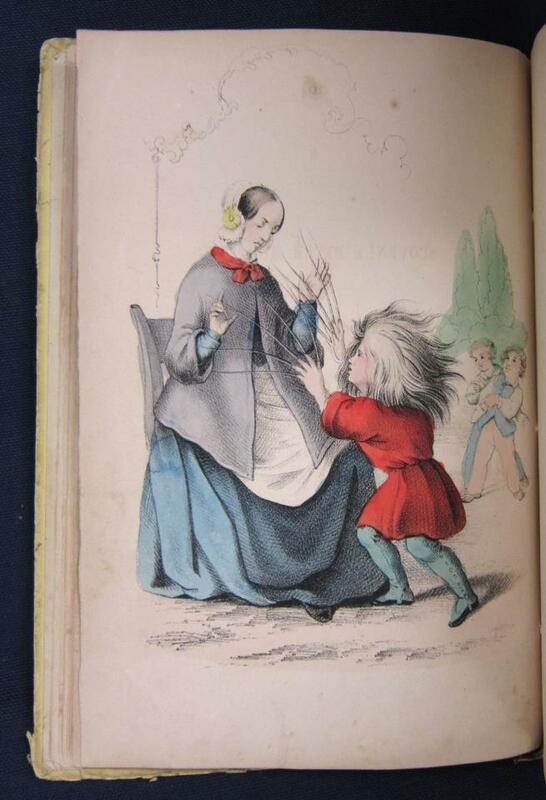 it’s from a german tale book. They translate it as “Shock-Headed Peter” haha. 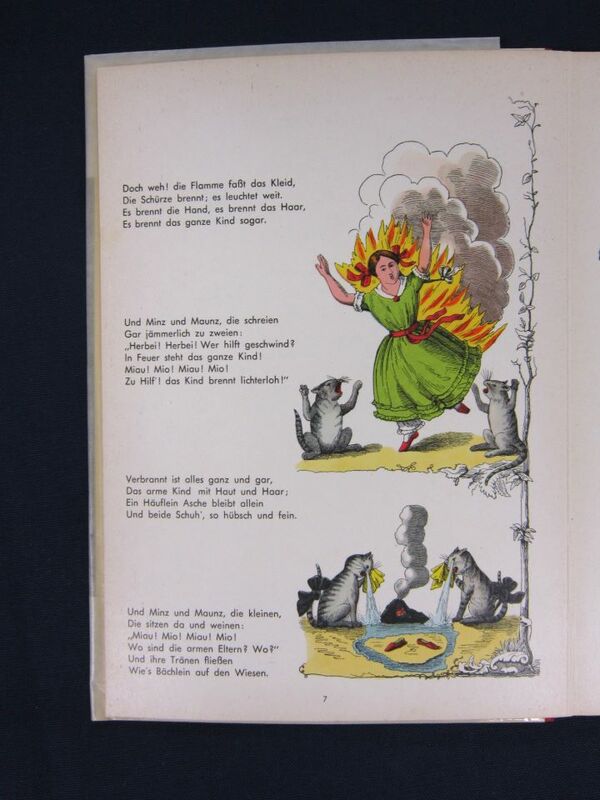 These are didactic stories from old Germany though my grandma thought these were good bed time stories. One kid has knives fall on top of him. Another one doesn’t eat his soup and goes out in a tornado and gets blown away. A girl catches her hair on fire and burns to death. Those were my childhood stories. Strublepater hahaha. how could I forget? 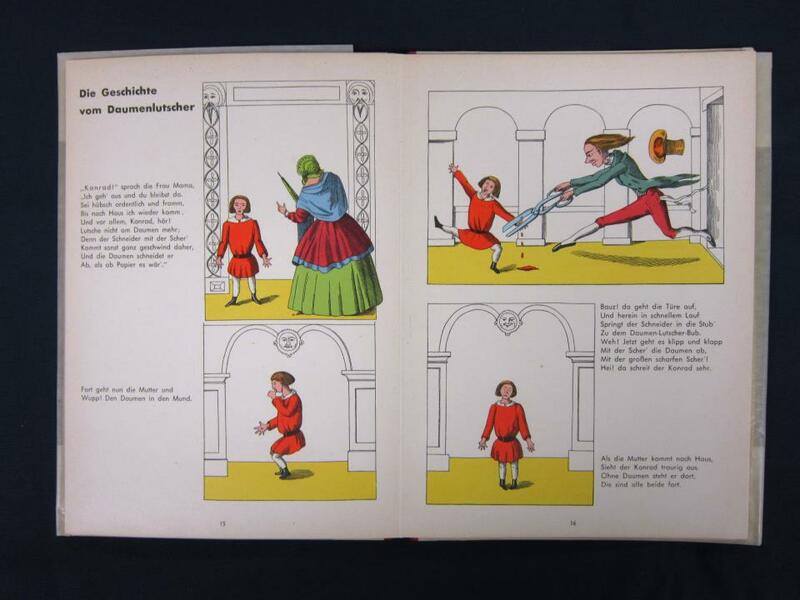 Struwwelpeter. Gruesome stuff. So crazy that this is one of the first true children’s books. 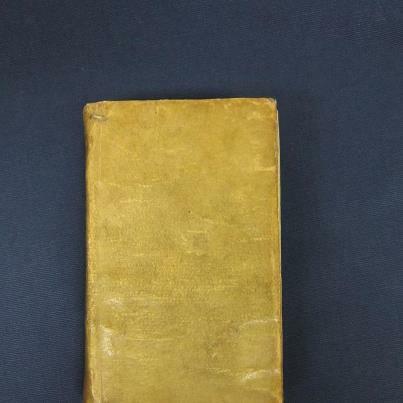 Today’s imprint, the last in the series is another grimoire. It is purported to contain the secret knowledge, given to him by the archangel Gabriel, that the biblical King Solomon used to summon up demons. The words necessary to summon Lucifer, Beelzebub or Astaroth. According to the book, Lucifer is often busy and Beelzebub very, very cranky, so Astaroth is probably your best bet. Use at your own risk! Of course, we are NOT responsible if you want to try this out for Halloween. If you do and get some interesting results though, let us know. Happy Halloween! And, there you have it. Wasn’t that fun and fascinating? I don’t have time to seek out these things, so I’m glad Oliver took the time. I learned a little bit something about our collections. Though, as I keep saying, everything is folklore, there is nothing like a holiday to evoke traditional notions of folklore, even as these notions are simultaneously being infused with modern practices and sensibilities. These days, Halloween appears to be more of a modern holiday than anything, despite being based on more ancient traditions. At my library, we took this occasion to highlight some items from our special collections. These “scary” books fall within the realm of more traditional folklore, with three of them dealing with magic or the occult. The remaining two could be categorized under customs and traditions.